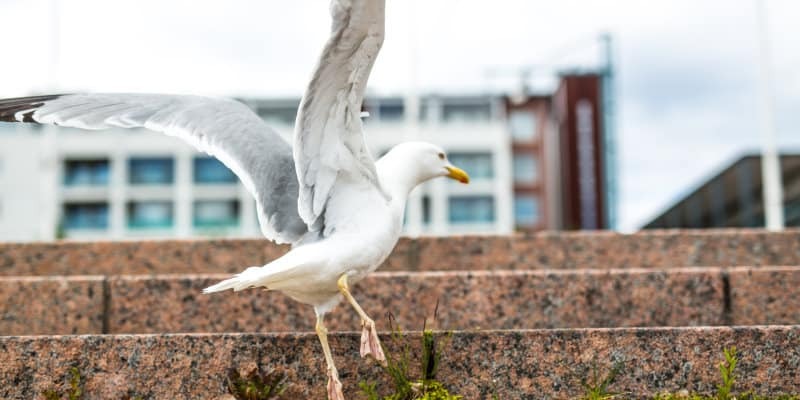 Gulls are among the most prevalent pest birds in Britain, making gull control a major concern for a wide range of businesses. If left to their own devices, gulls can cause huge problems, especially when they become aggressive and start attacking members of the public. While most associate gulls with the seaside, they are in fact equally common in inland towns and cities. As scavengers, gulls like to gather in areas where there will be a lot of readily available food for them to eat- and that makes urban areas a particularly tempting target for these pest birds. They are now just as commonplace as feral pigeons and can be found almost anywhere that humans live. Just because they are prevalent, though, doesn’t mean that they aren’t a threat to humans- as we will explain below. In fact, gulls can prove to be much more of an issue than other species of pest birds. That’s because whereas species like pigeons tend to be fairly docile, gulls are smarter than the average bird. If they are determined to get in somewhere to roost or tear open a bin bag full of rotting food, then they will generally keep at it until they have succeeded in their goal. If you see a bin with rubbish strewn all around, then it’s a pretty safe bet that gulls were responsible. This behaviour also makes gull infestations harder to deal with than other types of infestation and typically requires a more far-reaching solution, such as using several different methods of pest bird control at the same time. Gulls can also be a major issue because of how aggressive they may become. This is especially true when parent gulls are looking after chicks and their maternal instincts kick in. Gulls have a wide range of vision to help them spot sources of food below, but this comes at the cost of full depth perception. In practice, this means that they may be on a ledge several storeys up, but see people walking below as an immediate threat to their young. They can’t tell whether or not the passer-by is within a metre or two of their nest, and in their eyes, it is better to be safe than sorry. This explains why gulls may suddenly swoop down on people below without warning- but understanding the cause doesn’t make the behaviour any more acceptable. If left to infest an area, gulls will periodically become aggressive each nesting season- so it is vital that you break this cycle and stop pest birds from causing a nuisance. Since gulls can be so tricky to deal with, Pest Solutions use a wide range of different methods for gull control. For existing infestations, we use approaches such as nest and egg removal, as well as audible and visual bird scaring systems, to encourage the gulls to migrate somewhere else. Of course, this only deals with the short-term issue. To ensure that your property has adequate long-term protection against gulls, we also fit all manner of gull deterrent systems. These include common techniques such as bird nets and spikes, as well as more innovative solutions like bird free gel, which appears like fire to gulls. They will therefore naturally stay well away from this perceived source of danger, and thus stop causing a problem on and around your property. Whether it’s the latest pest bird control technology or tried-and-tested practices, you can count on the experts at Pest Solutions to come up with a tailored solution that will work best for your particular property. A gull infestation can be extremely distressing, but don’t panic- Pest Solutions are always here to help with all you gull control needs. With local branches all across the country, we are able to respond to calls fast and deliver the optimal gull control methods for your unique needs. To arrange a service call out, or for a FREE survey to show you what we can do, simply contact us directly on 0800 027 2555. With professional, discrete gull control, you can count on Pest Solutions to help you tackle any gull problem, large or small.